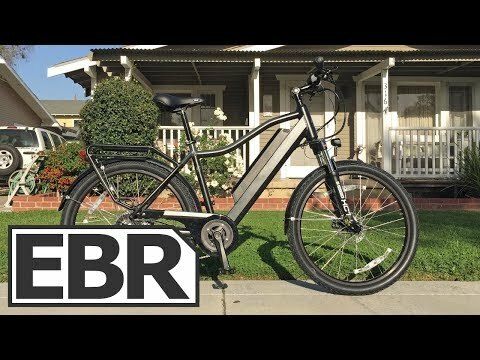 https://electricbikereview.com/surface-604/colt/ The Surface 604 Colt is a value-priced, hybrid electric bike with plastic fenders and a chain cover to keep you clean, integrated LED Lights to keep you seen, and an adjustable suspension fork and stem to improve comfort and fit. High-step diamond frame improves strength and stiffness but also slopes for easier mounting and comfortable stand-over position, integrated rear rack feels sturdy, includes pannier hangers and bungee loops. Available in two frame sizes, most of the wires are internally routed, pedal assist feels smooth and natural because it uses a torque sensor, variable speed trigger throttle, hydraulic disc brakes feel powerful and smooth. The tires are pretty basic (no puncture protection or reflective stripes), plastic fenders are durable but usually rattle more than steel or alloy, headlight is mounted to fork arch and may bounce around, great kickstand, optional suspension seat post.